Lipoxin A4 (LXA4) is a biologically active product of the lipoxygenase pathway. LXA4 stimulates leukocyte chemotaxis without aggregation and inhibits natural killer cell cytotoxicity. It also provokes contraction of parachymal strips and stimulates microvascular changes. Recent findings indicate that LXA4 inhibits leukotcyte-dependent inflammation. Determination of LXA4 levels may provide new understanding of the role of LXA4 in basic cellular reactions and in pathophysiology of inflammation and other disease processes.This competitive ELISA allows for quantitative analysis of LXA4 levels in biological fluids. 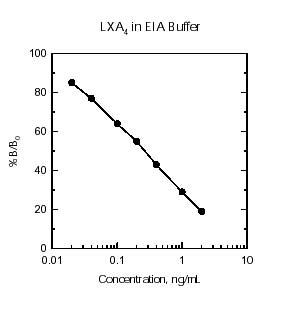 This is an ELISA for the quantitative analysis of LXA4 levels in biological fluid. This test kit operates on the basis of competition between the enzyme conjugate and the LXA4 in the sample for a limited number of antibody binding sites. The sample or standard solution is first added to the microplate. Next, the diluted enzyme conjugate is added and the mixture is shaken and incubated at room temperature for one hour. During the incubation, competition for binding sites is taking place. The plate is then washed removing all the unbound material. The bound enzyme conjugate is detected by the addition of substrate which generates an optimal color after 30 minutes. Quantitative test results may be obtained by measuring and comparing the absorbance reading of the wells of the samples against the standards with a microplate reader at 450nm or 650nm. The extent of color development is inversely proportional to the amount of LXA4 in the sample or standard. For example, the absence of LXA4 in the sample will result in a bright blue color, whereas the presence of LXA4 will result in decreased or no color development.